As we all know, I’m the lucky, lucky, so very lucky, recipient of the DNA for depression and anxiety. (Can my poor kids get a genetic do-over?) While I fully appreciate that most people want to be helpful, they are as equipped in dealing with depression as our government is in dealing with global warming. So I thought I would point out what isn’t helpful. It is generally not successful to say things like; think happy thoughts, just forget about it, count your blessings, it has to get better, etc. Why? Well for a few reasons. First, these statements come with an assumption that I’m an idiot and never would have considered such wisdom on my own. Really!?! Just think HAPPY thoughts? Oh Damn. I was focusing on the overwhelmingly dismal ones. Second, I can list conquered populations, throughout history, where things, as abysmal as they were, got much, much worse. 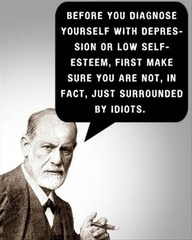 Third, depression is to “feeling a little down” as the common cold is the bubonic plague. Nyquil and chicken broth isn’t the answer. What is the answer? That is a post or another day.